What do you think of when you think “self-driving cars”? Do you imagine a life like the TV cartoon The Jetsons, with conveyor belts carrying you around—while a perfect cup of coffee automatically appears at the exact moment you want one? Or do your fantasies veer more toward the adrenaline-boosting movie Minority Report, with that chase scene where Tom Cruise leaps, jumps and runs through traffic that’s driving itself? Whichever image pops into your head, the self-driving cars of the near future borrow a bit from both. Here’s what else you need to know about them. GM leads the industry in getting self-driving cars into the driveways of the mainstream driving public. The automaker’s commitment to autonomous technology was boosted with its acquisition of Cruise Automation, a startup focused on self-driving cars. And after testing in locales as diverse as snowy Michigan, San Francisco, and Scottsdale, Arizona, North America’s longest-running auto brand is slated to start mass production any day now. Which car? A self-driving Chevy Bolt EV—the low-maintenance, all-electric car that delivers about 380 km on a single charge of its 288 cell lithium-ion battery. You might not have to wait much longer to enjoy the thrills of riding in a self-driving car. Reports say GM is planning to partner with ride-sharing company Lyft in a move that will see those same self-driving Bolt EVs used as an alternative to traditional taxis. That might mean it can only be a matter of time before they become available for purchase by the general public. As an industry leader in the self-driving arena, GM has predicted that they expect to be able to mass produce vehicles that are completely autonomous by the year 2020. In fact, they recently challenged 8 schools to come up with a way to build them at scale. One of the cornerstone of GM’s approach is the automaker’s Super Cruise system, slated to be included in a forthcoming Cadillac CT6 release. This system includes features such as automatic emergency braking, side collision avoidance, active lane keeping and lane steering. It also features adaptive speed cruise control that complements traffic conditions as diverse as stop-and-go city traffic to those at highway speeds. All these features are necessary for a safe and effective autonomous car driving experience. … it’s not GM’s autonomous car project. 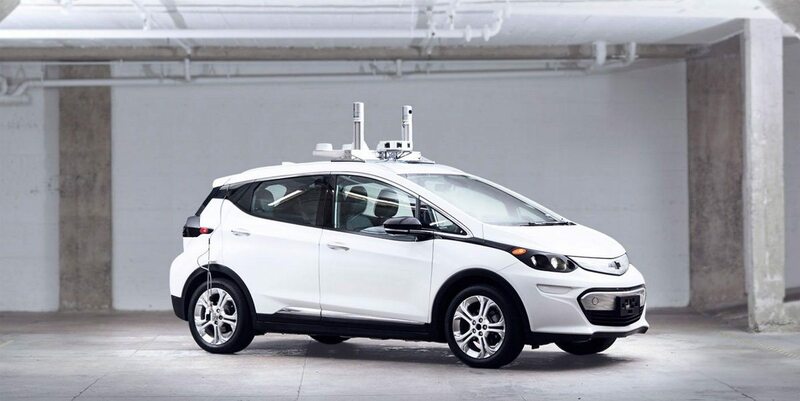 In fact, the Chevy Bolt is only one of more than 40 self-driving vehicles that GM has currently in its testing program. For example, as far back as April 2015, Chevrolet unveiled a concept car at the Shanghai, China auto show. 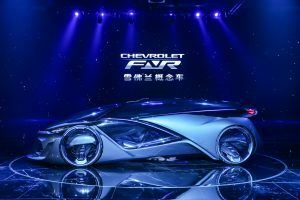 With a definitive nod to galaxies of the future, the Chevrolet FNR Concept is a self-driving car with outstanding touches like hubless wheels that feature built-in electric motors. Dual-swing entries—dubbed “dragonfly” doors—sleekly and deftly open to allow access to the futuristic styling and features that await inside. Other notable details that the FNR Concept included are crystal laser headlamps and taillamps. Plus, the ability to charge itself automatically—and wirelessly—would take the tedium out of ensuring that the battery offers sufficient power. Best of all, starting the vehicle involves eye-recognition technology—you can’t make it go without an iris scan. “Chevy’s FNR concept basically defies all description. The closest thing I can come up with is that it looks like you took a next-gen Volt, mixed it with a BMW i8, and sent the two spiraling 50 years into the future. The car — designed by GM’s Shanghai-based Pan Asia Technical Automotive Center team, is described as featuring a “futuristic capsule design.” That’s an understatement, needless to say. 5. Self-driving cars may be just around the corner, but there’s still plenty of action for those who love to drive. If the thought of a car that drives itself makes you cry real tears, that’s OK—we understand. And we invite you to browse our showroom for some of the best that Chevrolet, Buick, GMC and Cadillac offer today. We’ll even automatically bring you a cup of coffee at the exact moment you want one.